WSIB compliant first aid and CPR training in Toronto! Certified training partner with the Canadian Red Cross Society! Our state-of-the-art training facility incorporates EVA foam flooring, which makes it a first (and only) training facility in the greater Toronto area to have soft foam over the entire floor. This makes ground exercises such as CPR compressions extremely comfortable! Need a first aid and CPR instructor to train multiple employees? Don't sweat it! We will come to YOU and teach first aid and CPR courses on-site at your facility! Our first aid and CPR courses are affordable, fun, and informative. Learn from certified Canadian Red Cross first aid instructors! All of our certifications are approved by the Workplace Safety Insurance Board (WSIB Ontario) and the Ministy of Labour! A perfect gift for a friend, family member, or co-worker! Is it a birthday, anniversary, or other important milestone that’s coming up but you can’t decide on what to get that special someone? 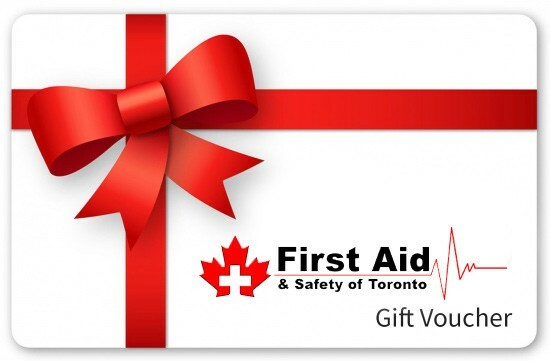 Why not give them a gift card from the Academy For First Aid & Safety? Our gift cards are issued electronically and don’t have a dollar value. Instead they can be purchased and redeemed for any first aid course we offer! And that’s not all, they DO NOT expire! Show your family, friends, and/or co-workers that you care about their safety by purchasing an on-line gift card today! The Academy For First Aid and Safety Toronto is a first aid and CPR training company located in Toronto. We provide WSIB compliant and approved first aid, CPR, and AED training courses, taught by certified Red Cross first aid trainers. We are a proud training partner with the Canadian Red Cross. The trainers in our First Aid course and CPR course in Toronto are are certified in First Aid training and CPR training with extensive experience working with students.